You know that saying about old dogs and new tricks? Well it applies to people too. In this case, the trick is weight training. According to a recent study in the Journal of Strength & Conditioning Research, women in their 20s and women in their 60s gained strength from lifting weights at the same rate. Ergo…it’s never too late to start! The study suggests this tip for getting stronger, faster: add an extra 5 percent to the amount you usually lift and you’ll get up to 38 percent stronger in 13 weeks. So for example, if you usually leg press 100 pounds, go up to 105 the next time around. The math isn’t so easy if you’re using 8 pound weights to work your biceps. An extra 5% would mean you’d have to lift 8.4 pounds. 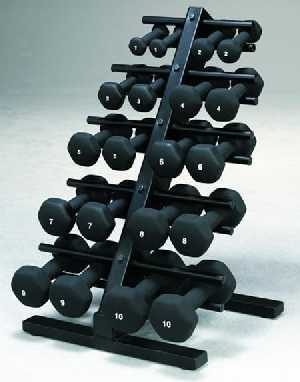 I don’t know about you, but I’ve never seen an 8.4 pound dumbbell! Here’s what I suggest: work with the 8 pound weight until you notice it’s too easy to pump out 2 sets of 12. The last couple reps on both sets should be hard to do, but not torture. When it’s too easy, it’s time to move down the dumbbell rack. This entry was posted on March 30, 2011 at 9:59 am and is filed under Working Out. You can follow any responses to this entry through the RSS 2.0 feed. You can leave a response, or trackback from your own site.